Birdbaths are found in the gardens of many different cultures and come in various shapes, sizes and designs. They are attractive in a garden and make nice accent pieces for a yard. A birdbath will attract birds and studies have actually shown that if you have clean moving water, you will attract 2 to 3 times the amount of birds that you normally would. The water should be kept at about 3 inches deep, and it should be cleaned regularly. 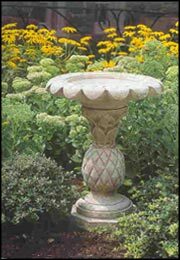 In choosing a birdbath, consider going with a large birdbath. Other ideas are; add a mister to an existing birdbath, and replace the water daily. Birdbaths can be found crafted in resin, plastic, concrete, stone, copper, and other metals. Consider placing a bird-feeder and bird-house nearby for your feathered friends.